Despite what you’ve heard about South London, this part of the capital truly gives you a different and exciting experience in comparison to other parts of London. If you manage to look past the countless Morley’s chicken shops around you will come to find some stunning sights and attractions spread across the ‘South Side.’ We’ve listed 57 of South London’s Best Landmarks and Attractions (including sculptures, churches and cinema’s) that set South London apart. We’ll kick things off with Albert Bride which was designed and built by Rowland Mason Ordish in 1873. It may not be as popular as another bridge further down the list, but it’s most certainly one of the most recognisable places in the Borough of Wandsworth. Photographers would have a field day after the sun sets as it is illuminated by 4,000 bulbs at night, making it one of South West London's most striking landmarks. The bridge connects Battersea on the South bank to Chelsea. As part of the Church of England, the parish church was built in 1857 and designed by the architect Benjamin Ferrey. 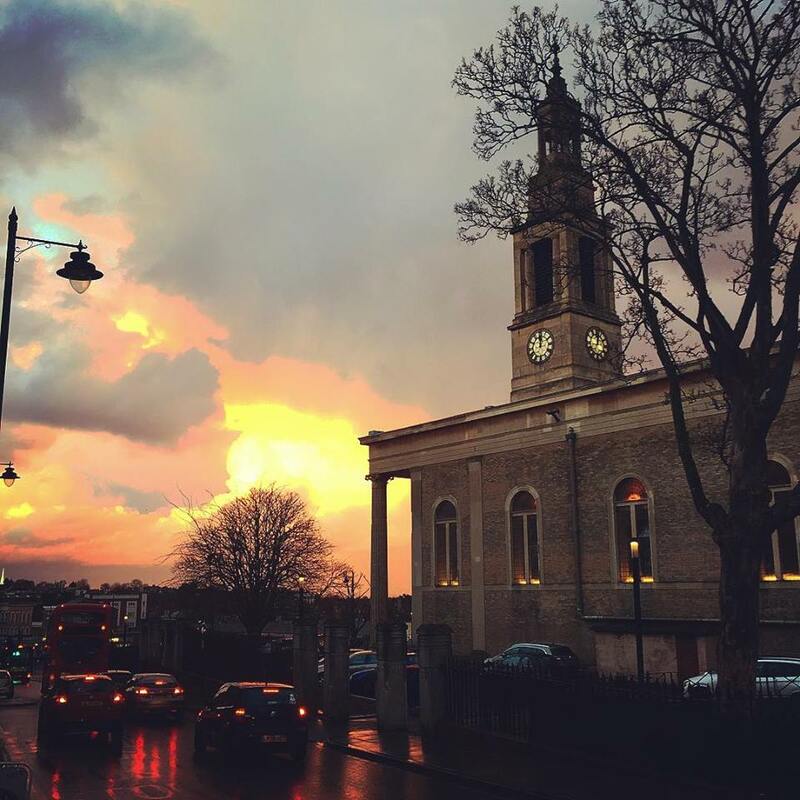 The dazzling church is visible from Blackheath Station and has become the defining image of the area. 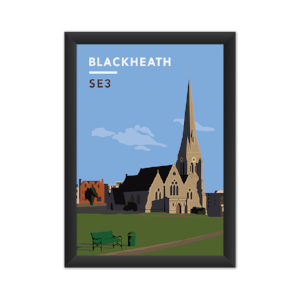 Blackheath All Saints Church Art Print! The Baitul Futuh Mosque, which is sometimes referred to the as Morden Mosque, Is one of the country’s largest Mosques and one of the largest in Western Europe. The sight can accommodate up to 10’000 worshipers, while conveniently being located a short distance away from Morden station. A fire broke out in the ground floor of the complex in 2015 with no suggestions of it being an act of arson. The Mosque hosts a number of events for Muslims and the wider community. 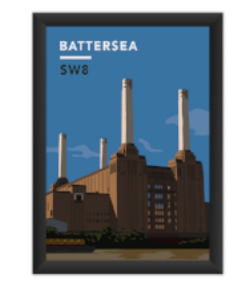 Another prominent landmark that calls Wandsworth home is Battersea Power Station. It actually comprises of two individual power stations in the form of a single building. The first part of the power station (A) was built in the 1930’s while the second was constructed 20 years later (B). The second was practically identical in the way it was built which gives it its now iconic 4 chimney view. One of the younger additions on our list, The Bermondsey Lion was unveiled in July 2011 created by Kevin Boys for Southwark Council. The lion itself has been a long lasting symbol of the area of centuries with the lion also forming the major part of the former Metropolitan Borough of Bermondsey's coat of arms. A Lion is also represented on the crest of Bermondsey’s local football team Millwall FC who play in the Second tier of English Football. Millwall are nicknamed ‘the lions’ and their home games are played at The (Lions) Den. 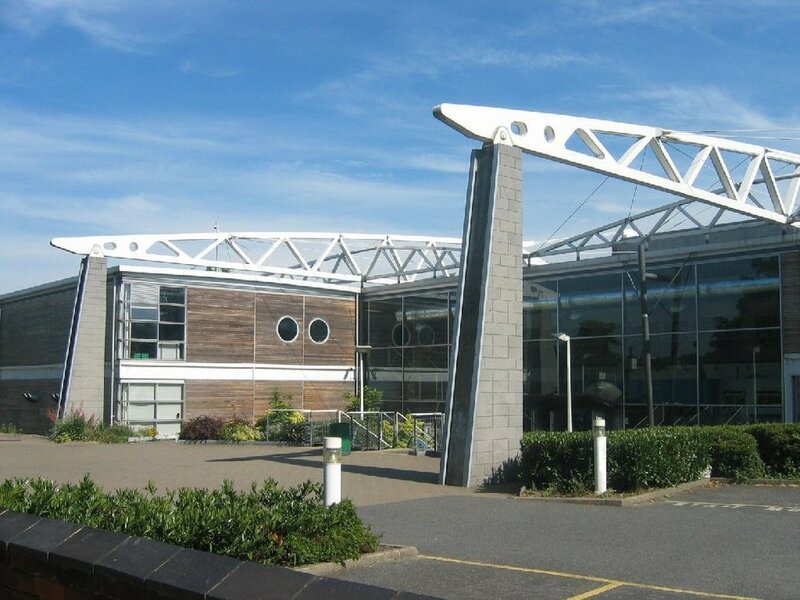 The Brit school is a British performing arts and technology school located in Croydon. The school is considered to be one of the finest performance arts schools in the country with many notable alumni. It has multiple professional theatres, the Obie Theatre, which can seat up to 324 and standing audiences up to 500; and the BRIT Theatre, which opened in January 2012. Notable people to have attended include Adele & Amy Winehouse. Erected just over 200 years ago in 1816 the Brixton windmill is one of three landmarks in Brixton that feature on our list. The Windmill reopened to the public in 2011, after undergoing a £600,000 renovation, and has recently been shortlisted for a Museums and Heritage Award for Excellence. 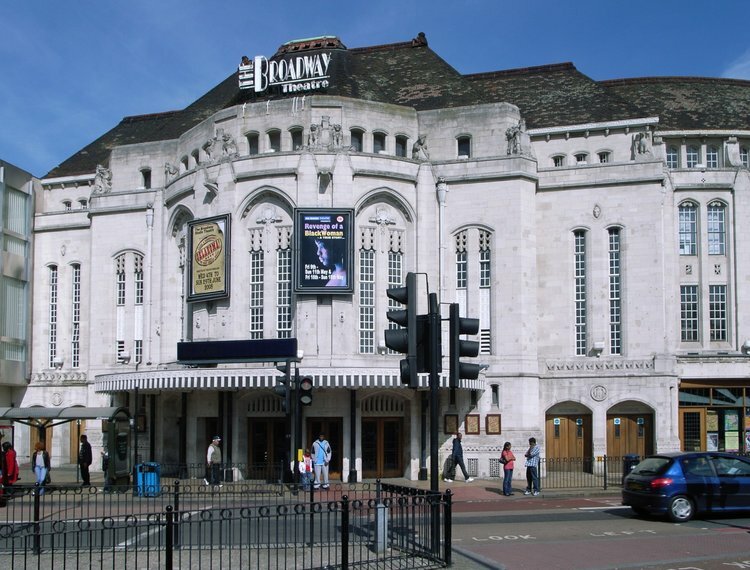 The Broadway theatre is a vast complex sitting in Catford that carries a reputation for being a staple feature of Lewisham’s intriguing architecture and history. Our blog on the history of the theatre can be seen here! Erected in 1974 as part of the Catford Centre development, its existence is down to design decisions made by architects Owen Luder and Rodney Gordon (the pair also designed the Michael Faraday Memorial in Elephant & Castle, you know, the big silver box in the middle of the roundabout). You can learn more about the history of the Catford Cat in the blog we did a while back here. Our Catford Cat Print is available to purchase! Regarded as the best-preserved ambitious Jacobean house in Greater London, The Charlton House was built in 1607–12 of red brick with stone dressing. Many of you may consider ‘The Valley’ to be Charlton’s most noteworthy place but considering the team are languishing in the third tier of English Football we decided to leave it out. If it helps Selhurst Park didn’t make the list either. Chislehurst Caves is a long series of tunnels that were previously employed for chalk mining, but have now become a tourist attraction. 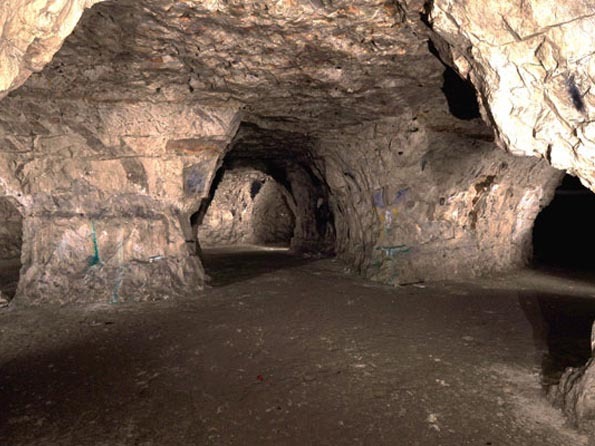 Despite the name, the caves were actually manmade for mining purposes during the 13-19th centuries. 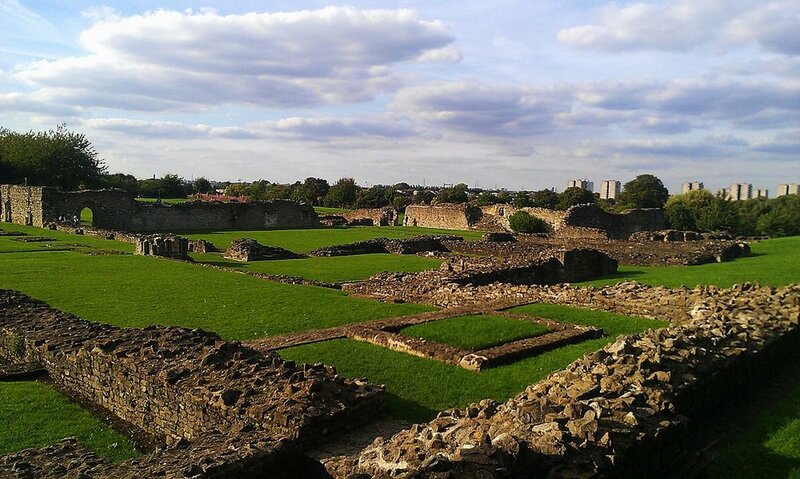 Croydon Palace was the summer residence of the Archbishop of Canterbury for over 500 years. The connection between the archbishops and Croydon is very much prominent today as a number of streets are named after archbishops, while the relationship is also recognised in the coat of arms for the Borough of Croydon. The current red brick building, designed by Charles Henman, was opened in 1896. 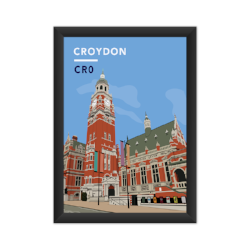 Rep Croydon and grab our fab print! If you haven’t seen the dinosaurs, you’re truly missing out. The models are eye catching for children and adults and it’s free! We also wrote a blog about the dinosaurs a few months back. Check it out here. Ah good old Crystal Paris. 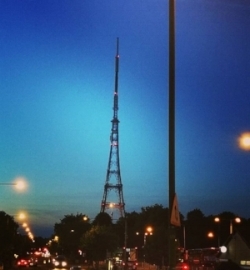 Growing up in South London you may have thought you were looking at the Eiffel Tower in your younger days when in fact it was most likely the Crystal Palace transmitter. It may not be as glamorous, but it’s still worth visiting. The station is the 5th tallest structure in London, and is best known as the main television transmitter for the London area. One of the multiple landmarks in Greenwich, the Cutty Sark was built on the River Clyde in 1869 for the Jock Willis Shipping Line, she was one of the last tea clippers to be built and one of the fastest. It sits next to the Greenwich Foot Tunnel. On January 10th 2016 South London’s favourite son David Bowie died. In his honour a memorial in his hometown of Brixton was created and has remained a destination for fans from across the world wishing to leave personal messages, flowers and items. The Dulwich Picture Gallery was designed by Regency architect Sir John Soane and opened to the public just over 200 years ago in 1817. It is in fact the oldest public gallery in England. 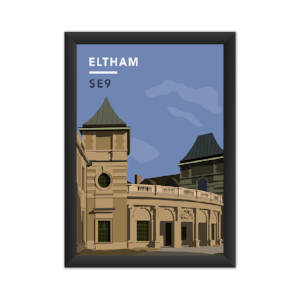 Eltham Palace is a large unoccupied royal residence in Eltham that can lay claim to being one of the most decorated landmarks on our list in terms of its history. The palace was previously utilised as a royal residence between the 14th – 16th centuries. The building was restored and opened to the public in 1999.
opened in 1962, Fairfield Halls is an arts, entertainment and conference centre, which contains a theatre and a gallery. The large concert hall has been regularly used by the BBC and the complex is often used by local schools also. Major General James Wolfe was a British army officer remembered primarily for his victory in 1759 over the French at the Battle of the Plains of Abraham. A statue in his honor was built in 1930 and was designed by Dr. Tait Mackenzie. The Imperial War museum and its ground-breaking galleries tell the stories of people whose lives have been forever impacted by conflict, from the First World War to the present day. The museum has occupied the former Bethlem Royal Hospital on Lambeth Road since 1936. 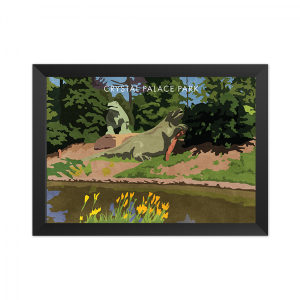 Grab the Ladywell Playtower Art Print! 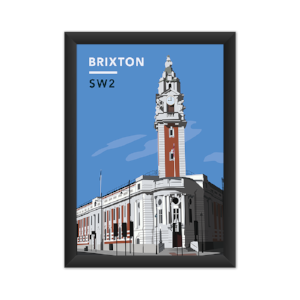 Commonly referred to as the Brixton Town Hall, the building is a stones throw away from the Ritzy Cinema while also being very close to Brixton Underground Station. 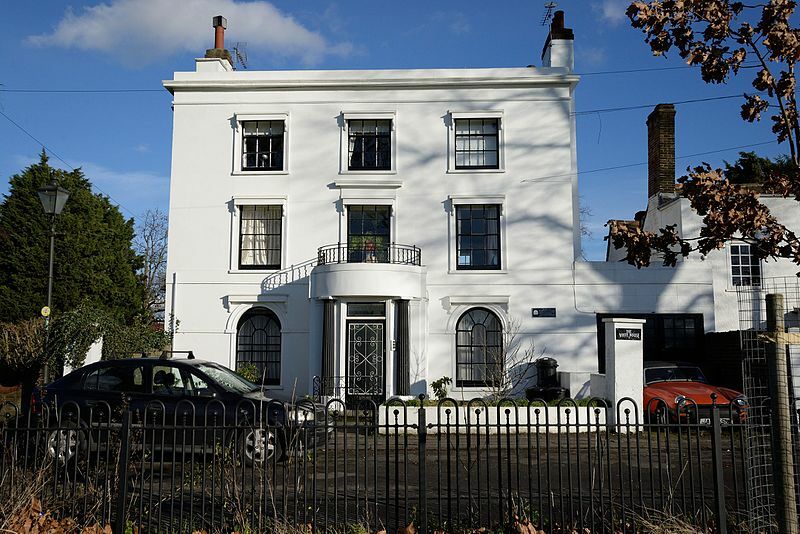 it was built in 1908, and designed by British architect Septimus Warwick. The Lewisham Micro Library as it’s become known is said to be London’s smallest book repository. 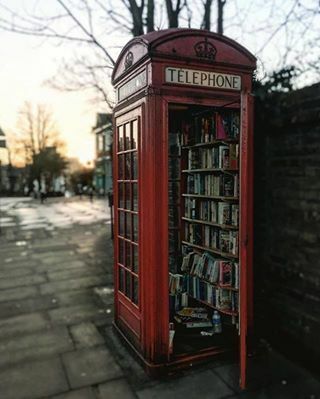 The telephone box/Library which stands near the corner of Loampit Hill and Tyrwhitt Road, just a stone’s throw from St John’s station, has operated since 2013 as a book exchange. We wouldn’t recommend visiting with a friend for obvious reasons. Not much introduction needed for this one as it’s quite clearly one of the most recognisable landmarks in the UK let alone South London. A Great place to be when entering a new year! 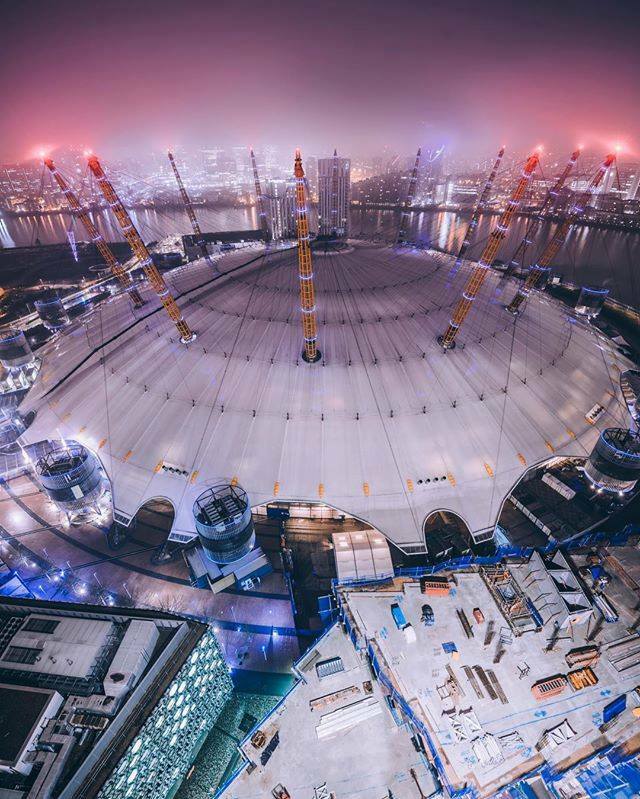 Formerly known as the millennium dome, the O2 is one of the largest buildings of the kind in the world and has hosted numerous major events such as concerts and sports competitions. The arena has the 2nd largest seating capacity of any indoor arena in the UK and was and was also used during the London 2012 Olympics. A sculpture in the form of twelve disused red telephone boxes that have been tipped up to lean against one another, this fantastic sculpture by David Mach can be found in Kingston. 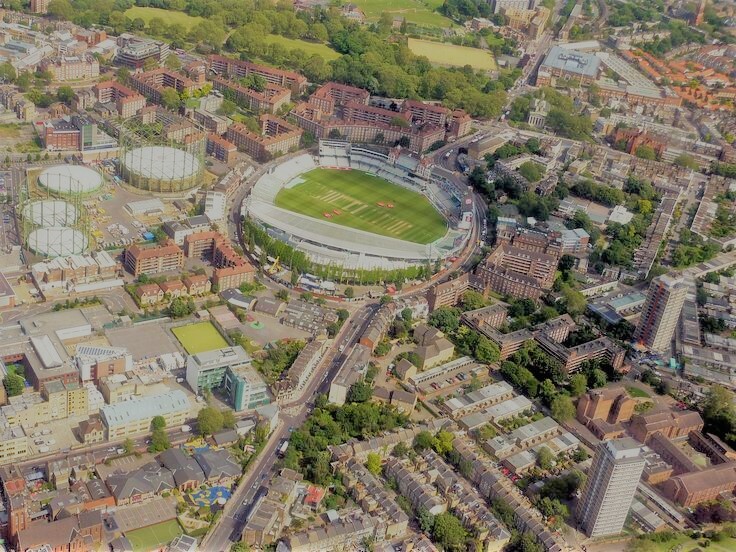 Home of Surrey County Cricket Club, the Oval cricket ground has been open since mid 20th century while also being the first ground in the country to host international test cricket in 1880. Despite its long association with Cricket, The Oval also has history in football as the first ever international game between England and Scotland was played there. The Peace Pagoda was presented to Londoners by the Venerable Nichidatsu Fuji in 1984. The Pagoda features a series of gilt-bronze statues which represent the most significant stages of Buddha’s life; birth, contemplation leading to enlightenment, teaching and death. 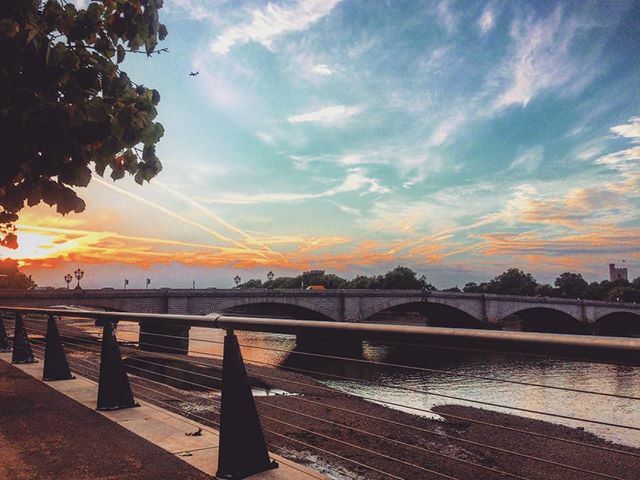 It may not be as glamorous as Albert Bridge or any of the other bridges on the list, however we feel Putney Bridge is a fully noteworthy landmark that deserves some respect. It links Putney of the south side to Fulham. The cinema opened on 11 March 1911 as "the Electric Pavilion". It was built by E. C. Homer and Lucas for Israel Davis. The nearby Brixton theatre was completely destroyed by bombing in the early 1940's which allowed the Ritzy Cinema to expand. Formerly named as the Royal Victoria Patriotic Asylum, the building was designed by Major Rhode Hawkins and the original purpose of the building was for the education and training of hundreds of orphan daughters of soldiers, marines and seamen who had died during the Russian War. 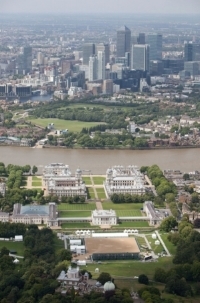 The best view in South East London (check out the contenders here) may actually be from the top of Severndroog Castle. If you haven't visited this splendid castle, we would highly recommend it for the view alone. 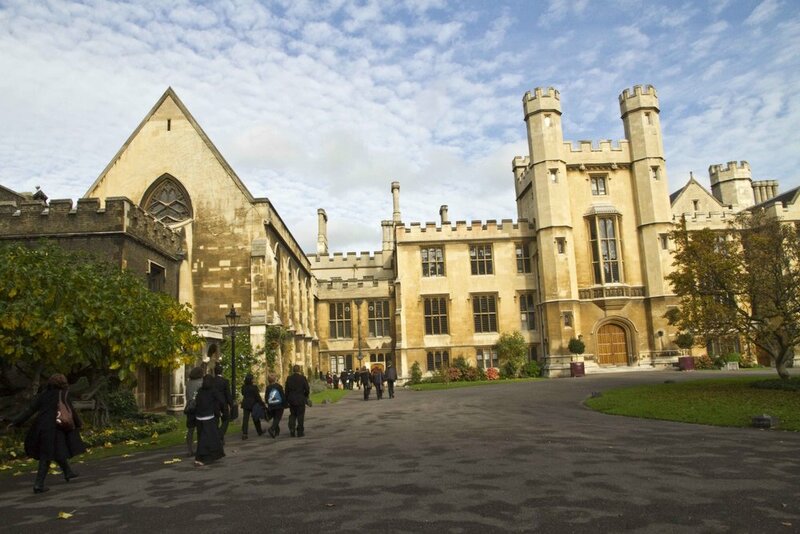 The castle was designed by architect Richard Jupp and is one of the many Gothic style buildings to feature on our list. We’re going to take a wild guess and assume you know who the great William Shakespeare is. This Elizabethan playhouse can be presently found in Southwark. Shakespeare's Globe was founded by the actor and director Sam Wanamaker, built not far from the site of the original theatre and opened to the public in 1997. In terms of age, the Shard is definitely one of the babies of the list as it was only completed in July 2012 and was subsequently opened almost exactly five years ago on February 1st 2013. In terms of size this huge building comfortably towers above the rest and it is in fact one of the tallest buildings across Europe. Although it is technically in South London, there are very few places across the capital where the Shard can’t be seen from. 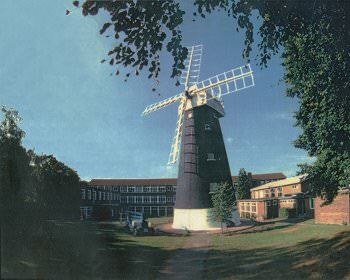 There has been a windmill in Shirley since 1808 when William Alwen first built a post mill, worked by the Alwen family until October 1854, when it was destroyed by fire. William Alwen’s grandson Richard built the present brick tower mill. The bricks may well have been made locally, and some of the machinery is thought to have come from a disused mill elsewhere. The South London Gallery, founded 1891, is a public-funded gallery of contemporary art in Camberwell, Southwark. It may come as a surprise but Southwark actually has two cathedrals, in this instance and in our previous blog we're talking about the Anglican Southwark Cathedral, sat on the south bank of the River Thames. Click here to read our blog on its well-regarded history. Don't worry we haven't forgot about Earlsfield and we certainly wouldn't forget about St Andrews. This Anglican Church was built in 1990 by architect Edward William Mountford. Now we’ll admit that they may be some argument as to whether St Georges Church falls in South London or Kent, but for the purposes of this list we’re going to go with the former. It is in the London Borough of Bromley though so that’s good enough for us. The church was originally built in the twelfth century. It was rebuilt between 1885 and 1887 as a “confident town church” by local architect W. Gibbs Bartleet. Another Church on the list, St Mary The Virgin Church sits next to the Putney Bridge. The building itself has actually been through numerous changes and parts of the church has survived from medieval times. The Bronze Woman Statue in Stockwell was London’s first public statue of an African-Caribbean woman. The anonymous figure is based on a poem of the same name by Guyana-born Cecile Nobrega, who lives in Stockwell. One of the largest museums of modern and contemporary art in the world, the Tate Modern is most certainly a must go place (you and/or your children have probably been on a school trip there). If you needed anymore incentive to visit that Tate Modern it’s completely free to access the collection displays. Tooting market has been established as one of South London's best indoor markets. 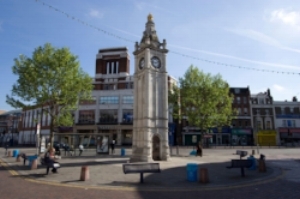 It has been a staple of the Wandsworth Borough community for over 80 years. The recent addition of some new hip stalls have rejuvenated the market. Although it's the only market on our list, there are a number of fantastic markets across South London that you can visit and we've listed them here. Another landmark that we assume doesn't need much introduction. Tower Bridge is one of the most iconic landmarks in the country although it does frequently get referred to as London Bridge incorrectly. Another famous sporting landmark to feature on this list is Twickenham, home of the England Rugby team. Much like most sporting venues in London, the venue is multipurpose with other events like concerts also taking place there. The stadium also hosted the most recent Rugby World Cup Final with New Zealand beating Australia 34 - 17 to win back to back World Cups. 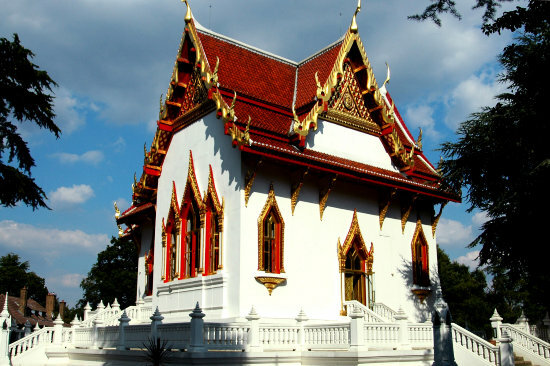 Home to monks and nuns (but welcomes visitors of all faiths) the Wat Buddhapadipa is certainly a sight for sore eyes. The exterior white walls juxtaposed with the red and gold colours of the roof make it one of the most aesthetically pleasing buildings Merton has to offer. The Wimbledon All England Club is of course the home of the Wimbledon grand slam tennis tournament which remains the only major tennis (Grand Slam) competitions to be played on grass. The sight has played host to many unforgettable moments including Federer winning his first grand slam and Brit Andy Murray winning Olympic Gold in 2012.